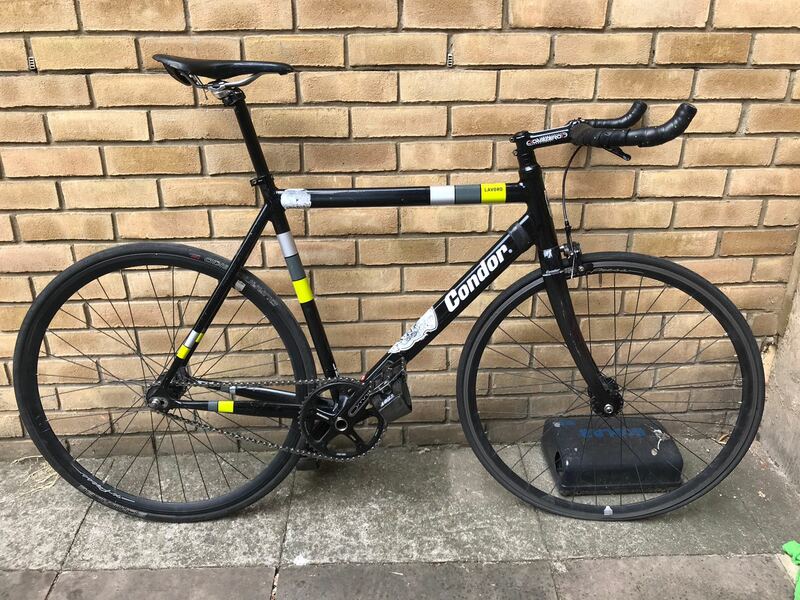 Regrettably, I am being forced to sell my beautiful Condor Lavoro, as I have no room in my house and now have a child - and cannot put a child seat on this beast. I am also throwing in a Hiplock orignal - Superbright lock. Basically, the bike wings. I have enjoyed some serious speed and countless hours of fun on this baby. That being said, there are a few love marks (surface scratches) on the frame, crank and pedals - but no serious damage that would affect the performance -all through a few years of labour and love getting me around London. Also, the grip tape will need replacing and the front tire is currently flat (I will be fixing this). Other than that, it is good to go. I reckon I have spent close to £1,250 on this and would like to get a decent amount to start my funds for my next purchase. Thinking around £800 all in - O.N.O. Hit me up for any further info, or if you would like to come test ride or check out the bike. Dropping this to £600 now as need to sell! You could try removing the stickers, giving it a good clean/wax and then putting up a few more photos. You might also want to sell the pedals and hiplok separately, as I’m not sure they add to the sale. Also, find out which Fizik model it is, as that may add more value then you think. Interested. Will send you a DM. @dannysolero I know this is probably not what you're going for, but I'd be potentially interested in the Omnium cranks if you do end up splitting it up. Hey all - @Hadders / @tag58 -I've been locked out of my outlook account so couldnt log in with my original login, so have created this new one here. DM me on this account and we can chat about the bike! I still have it and need to sell ASAP. Anyone else interested in this bike. Please DM me on this account as I have been locked out of my outlook account, so had to create another. Anyone know how I can reclaim my original account? Hey, this still for sale? I still have this bike. I've dropped the price to £400 now - no ono. £400 is ridiculously cheap for this! Would like to get rid this week. Any takers? This is still for sale - surely someone would like to take this for £400? Would drop to £350 if someone can take this week. £350!! Even if you want to break this down, you are getting a serious deal here! Anyone? !